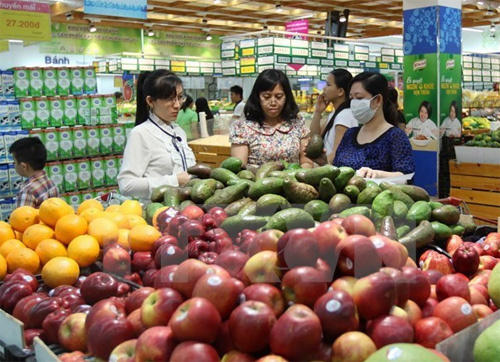 The February consumer price index (CPI) inched up 0.42 percent month on month and 1.27 percent year on year, mainly driven by high food demand during the Lunar New Year (Tet) holiday, the General Statistics Office (GSO) reported. Eight of the 11 main goods and services categories saw their prices increase from January, including food and catering services (1.98 percent), beverages and cigarette (1.15 percent), and apparel, hats and footwear (0.45 percent). Price declines were recorded in housing and building materials (0.41 percent), transport (3.96 percent), and post and telecommunications (0.16 percent). In the category of food and catering services, a 0.66 percent increase in grain food prices was the main driver of the CPI growth due to soaring demand in preparation for Tet in early February, said Deputy Director of the GSO’s Price Statistics Department Do Thi Ngoc. Foodstuff prices climbed 2.45 percent from the previous month, such as pork (2.01 percent), beef (3.22 percent) and chicken (2.46 percent), she noted, adding that vegetable prices were also stoked up by the impacts of a severe cold spell in the north before Tet. Rises in grain-foods and foodstuff prices, in turn, fuelled outdoor eating and drinking costs. Although public transport fares hiked 3.45 percent due to a surge in travel demand before and after Tet, domestic petrol prices were down by 9.29 percent from January, helping overall transport prices shrink by 3.96 percent, Ngoc said. In February, core inflation (the CPI without grain food – fresh foodstuffs, energy, and medical and educational services which are under the State’s management) grew by 0.56 percent from a month earlier and 1.93 percent from the same period last year. The Price Statistics Department forecast CPI in March will expand at a faster pace than that of this month, mostly due to the planned augmentation of medical service prices./.